Dutch innovation and high-tech capabilities – Super high-tech solar arrays made by Airbus Defence and Space Netherlands are crucial to the success of the mission as it is responsible to provide the needed energy at the farthest distance of the sun. Satellite Rosetta was launched in 2004, to start its ten-year journey to comet 67P/Churyumov-Gerasimenko. 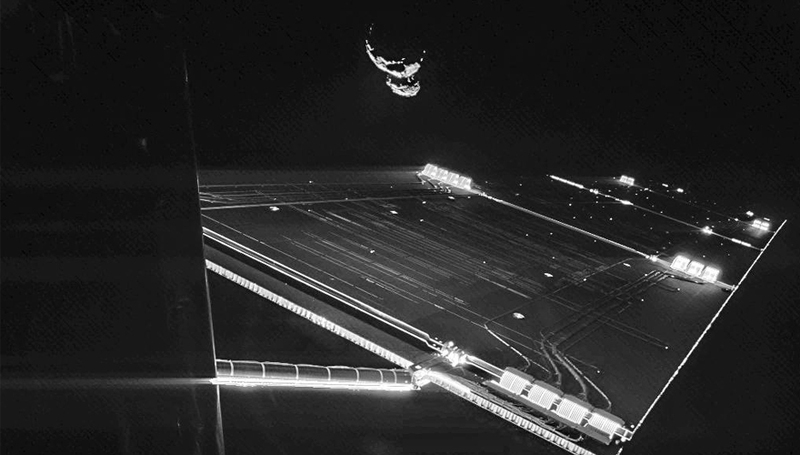 In August 2014 Rosetta arrived at the comet; its lander Philae is expected to land on the comet at a distance of 750 million kilometers from earth in November. Philea will investigate the comet in order to gain more knowledge about the universe. The long journey of Rosetta and its extreme distance from the sun impose specific requirements on the design of the solar arrays designed by Airbus Defence and Space Netherlands. The farther from the sun, the less light enters the wings and thus the less power it can deliver. To reach the farthest point of the journey (750 million kilometers from the sun), where only 4 percent sun intensity is present, Rosetta was equipped with solar arrays of up to 8,700 watts. During hibernation, which lasted over 900 days, Rosetta was so far away from the sun that the solar arrays could only get 400 watts of energy from the sun. Just enough to keep going. Two large wings – each consisting of five panels with a total area of ​​over 60 square meters – provide the vital energy of comet chaser Rosetta.